Here's one from the archives. Remember when Sinful Colors used to come in this round type of bottle? I had a whole bunch of them back in the day, and maybe I'm just biased because this is how they looked when I first started buying them, but I prefer the old-style bottle and logo. The new bottle is just so... odd. And bulbous. 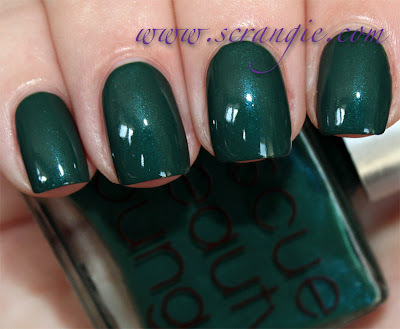 Sinful Colors Nail Enamel in Medusa. Medusa is a super rich dark mahogany brown. It has red, brown and gold shimmer that glows and smolders like embers within the blackened brown base. This is one of those colors that looks dark on the edges and light and glowing in the center. I'm kinda obsessed with this type of finish. It's just so fascinating to me. Red, brown, blue, purple, doesn't matter what color it is. If it has this finish, I want it! 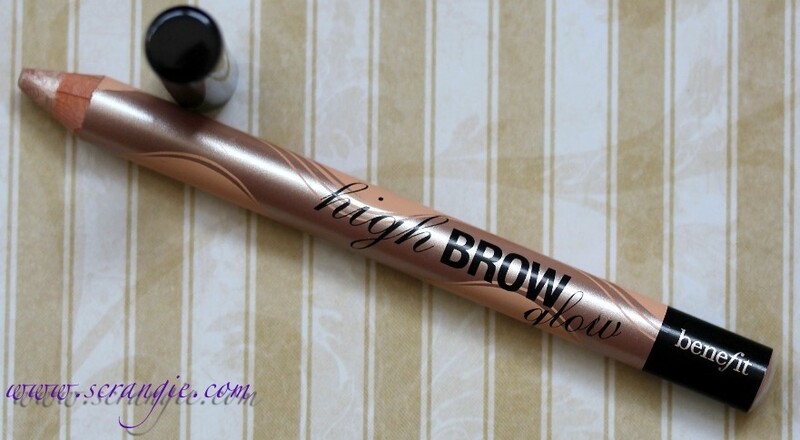 Benefit has added another brow-transforming tool to their already comprehensive lineup: High Brow Glow, a shimmery counterpart to their original matte High Brow brow-lifting pencil. Instead of the brightening matte pink shade of the original, the new High Brow Glow is a soft, slightly metallic champagne for people who prefer a little shimmer. If you've used the original High Brow, this applies the same way. You simply draw a line of it directly under your brow, following your natural arch, then blend out with your fingertips or a soft brush. You can start all the way from the inner corner of your brow and take it all the way out, or you can just put a little directly under your arch, however you like it. For added highlighting, you can even put a tiny amount just above your arch and blend it out. The color of this is a light neutral champagne with a smooth metallic shimmer. You can adjust the amount of shimmer by blending more for a smooth glow or less for a slightly more sparkly metallic sheen. 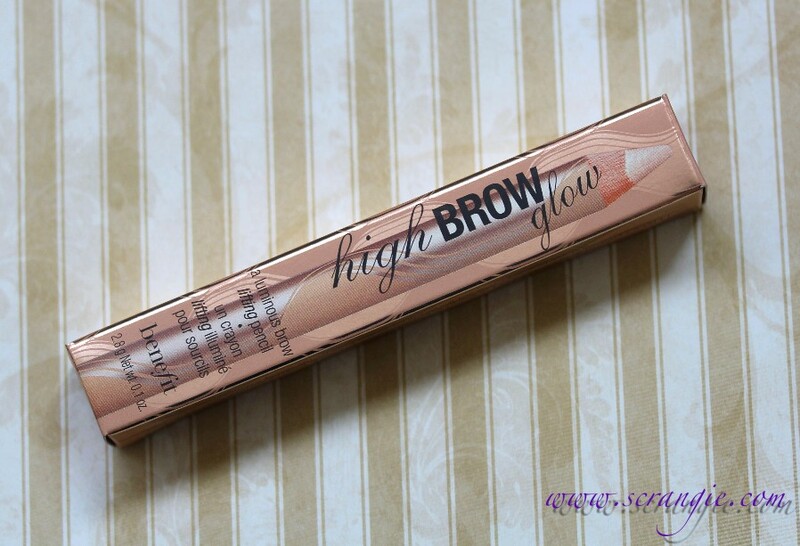 Really does brighten the eye area and visually lift the brow. 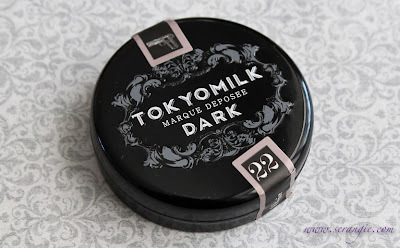 Also very good on the inner corners of the eyes, on the cupid's bow, or as a cheekbone highlighter. Smooth formula is easy to blend. 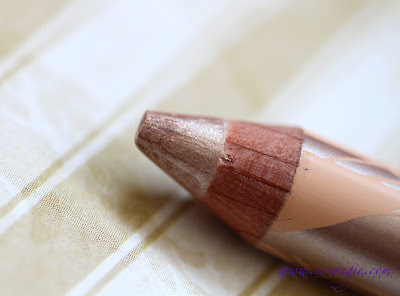 Neutral shade will flatter most skintones. The pencil is pretty big and each application uses very little product; this thing will last a very long time with normal use. Cute pencil design. I love the swirls and metallic pink champagne color of it. It can look too shiny/shimmery if over-applied or under-blended. I don't like having a very shimmery browbone so I have to be sure to blend carefully when I use this. The wooden pencil can splinter when sharpening. Requires a large-barrel pencil sharpener. It's larger than an eyeliner pencil. 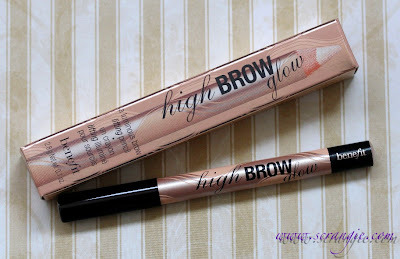 I really love the original matte High Brow and Eye Bright pencils, so it's nice to see a new shimmer version for summer. It does what it says it does, and it does it with very little effort. Nice, precise application and a smooth, creamy formula. Benefit High Brow Glow is available now from Benefit, $20 for a 0.1 oz pencil. What's this?? 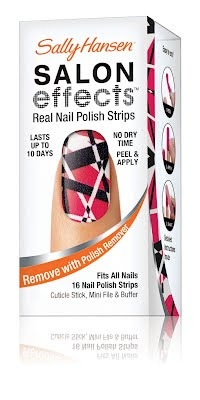 80s-rock-themed nail designs from Sally Hansen, including one that looks like Eddie Van Halen's Frankenstrat?! Too awesome. THINK: Amp up your nail design with some serious rock star treatment. WHAT THEY ARE: Edgy prints and patterns inspired by the head-banging film adaptation of the Broadway hit from New Line Cinema, “Rock of Ages,” distributed by Warner Bros. Pictures and in theaters nationwide on June 15, 2012. Get ready to rock with the Rock of Ages Salon Effects Real Nail Polish Strips collection from Sally Hansen. The manicure breakthrough from nail color authority Sally Hansen takes you back in time to the 1980’s, the decade of big hair and big dreams. The revolutionary peel-and-apply nail polish strips are available in eight limited edition patterns inspired by “Rock of Ages,” a rock ‘n’ roll romance story told through the heart-pounding hits of the 80’s most legendary bands. From rock star fashion to the decade’s hottest runway trends, like lace and neon hues, these designs are bold, colorful and guaranteed to leave you ready to rock. Just peel, apply, file and go, for a flawless, rock-star approved, real-polish manicure without the fuss. The ultimate fashion accessory, Salon Effects Real Nail Polish Strips are developed with an innovative DBP, Toluene and Formaldehyde-free formula that offers trendsetting, no dry-time nail looks which last up to ten days. Each Salon Effect Real Nail Polish Strips kit includes 16 nail polish strips, a cuticle stick, mini file/ buffer and instructions for easy at-home application. When you’re ready to change your nail strips, simply swipe nails with your favorite Sally Hansen polish remover for an instantly clean slate. 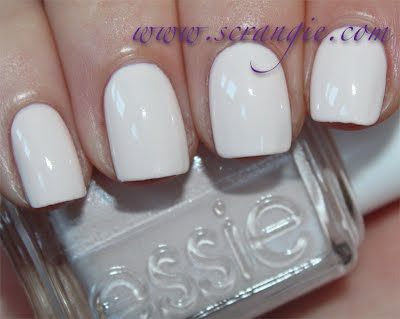 Essie's annual bridal color collection was a shock this year. Why? Because it contains no sheers. I'm serious, every color in this collection is a full-coverage opaque finish. How unexpected is that?! 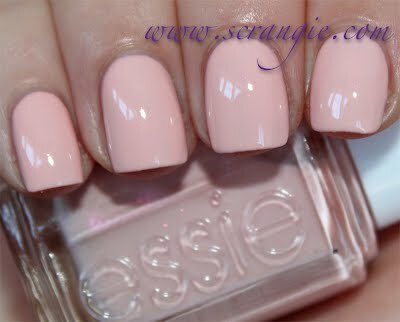 Essie Instant Hot. A peach-tinged white creme base with metallic silver shimmer. 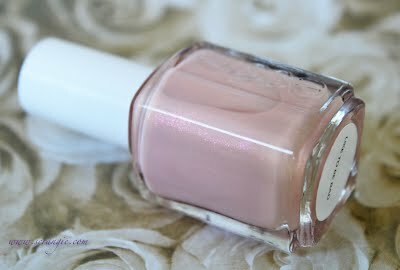 On my nails this looks mostly white with just a hint of peach to it, but in the bottle it looks a lot more peach. The shimmer in this is flat and silver, like silver foil, and the particles seem fairly large, but it doesn't show up on the nail. This color is also extremely streaky; it required four coats to become even. Looks very harsh. Essie Like To Be Bad. This is a peach-pink creme base with pink-purple-orange duochrome shimmer. Sadly, the shimmer in this one doesn't show up on the nail, either. You can see a little bit of it in very bright light, but not enough to really notice unless you're staring at it. 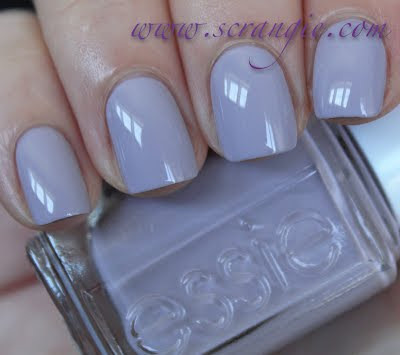 Essie Love and Acceptance. 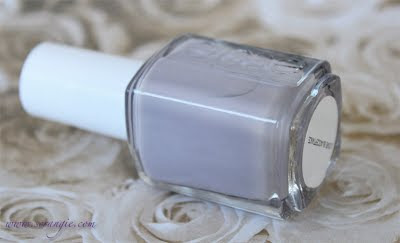 A very light grey-purple creme. Mellow and muted, slightly more purple than grey. Essie Who Is The Boss? Light blue-toned green creme. Has a bit of grey in it. It's quite faded/weathered/desaturated looking, but not quite pastel. Also very streaky. The formula on these was not good. All the shades were streaky, some worse than others. I did four coats of all just to even out the streakiness. The texture was a little less smooth than usual, which only exacerbated the streakiness of the polish. The dry time was good, though, very quick. Lately Essie has been so good about making their colors smooth and streak-free, so I was surprised and disappointed that these were so streaky. In addition to the streaky formula, all of the shades look rather harsh and chalky and I didn't find any of them to be flattering on my hands. I can't say that any of these are really worth having... Essie already has much nicer soft shades from previous collections that apply smoother and that don't look so harsh. Who Is The Boss? does seem like a unique color at least. 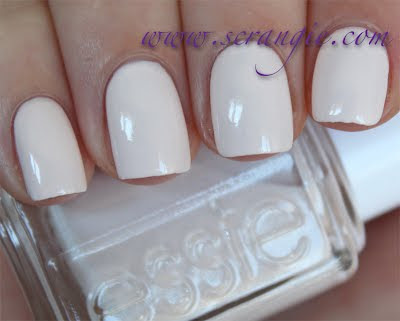 The Essie 2012 Bridal Collection is available at salons now. Edit: Anyone having problems viewing the images in full size, or is it just on my end? The new GOMM* collection from Rescue Beauty Lounge is a set of seven shades inspired by the life and works of an American artist. Rescue Beauty Lounge Abi*. Abi is a light, yellow-toned green with very subtle yellowed silver shimmer. Some of the shimmer is darker and more green, but most of it is a very light metallic greenish-yellow. This shade has a very faded, weathered look to it that does make me think of cactus and dried grasses in New Mexico. Rescue Beauty Lounge Bella*. Bella is a soft, clean white. It's the only one in the collection that has no shimmer at all. Instead, it has a creamy, soft-looking, translucent jelly finish. I found this color to be too streaky to wear alone with only one coat, but it was perfectly even at three, which is what I'm wearing here. Rescue Beauty Lounge Faraway*. This is a light turquoise with bright blue-green shimmer. The shimmer is small, subtle and is not immediately noticeable. In dim light, it adds a green cast to the polish, but in brighter light you can see that it's bright and green against the turquoise base. Makes me think of what Pure Ice Heartbreaker would be like with an opaque creme base. The shimmer in this is smaller, but the colors are similar in both. Rescue Beauty Lounge Ghost*. Ghost is a medium bronze shimmer. It looks quite dark here, but it is a bit lighter in real life. The base of the color looks like a neutral medium brown, but it's filled with iridescent metallic shimmer that adds warmth and multicolored sparkle to the polish. When the light hits this just right, the fine shimmer particles flash a rainbow of colors. 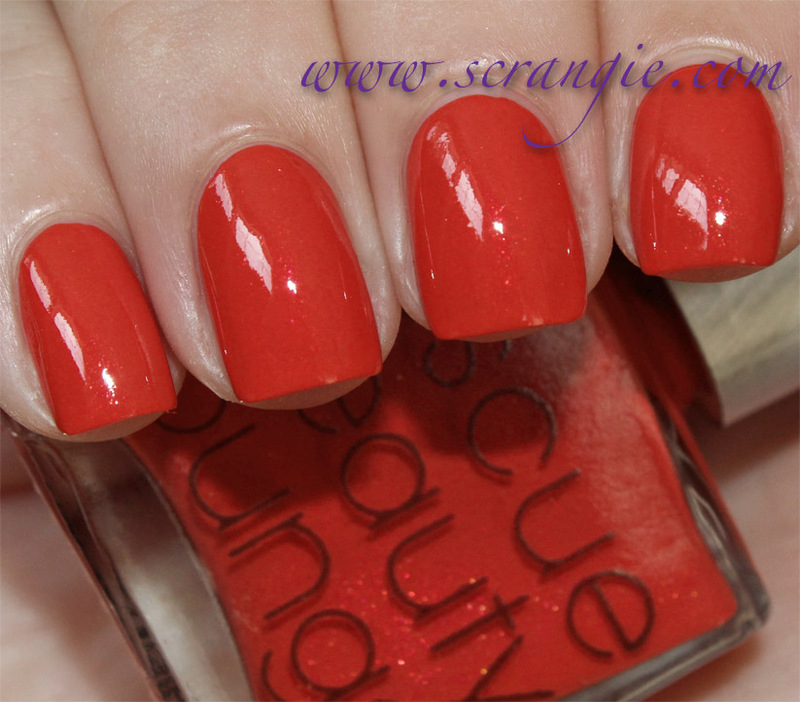 Rescue Beauty Lounge Jack*. This one is a dark and strongly blue-toned green with subtle teal and aqua shimmer. In indoor light, the very fine shimmer appears as a reflective blue haze across the surface of the polish. It only begins to look sparkly or shimmery in bright, direct light. 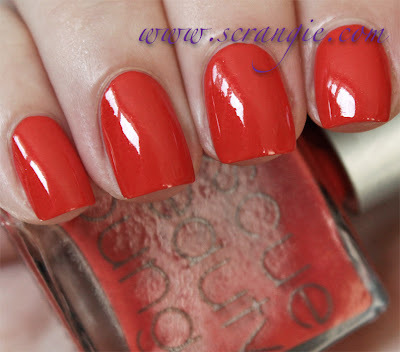 Rescue Beauty Lounge Poppy*. Poppy is a warm, bright poppy red with subtle pink-red-orange duochrome glass fleck shimmer. 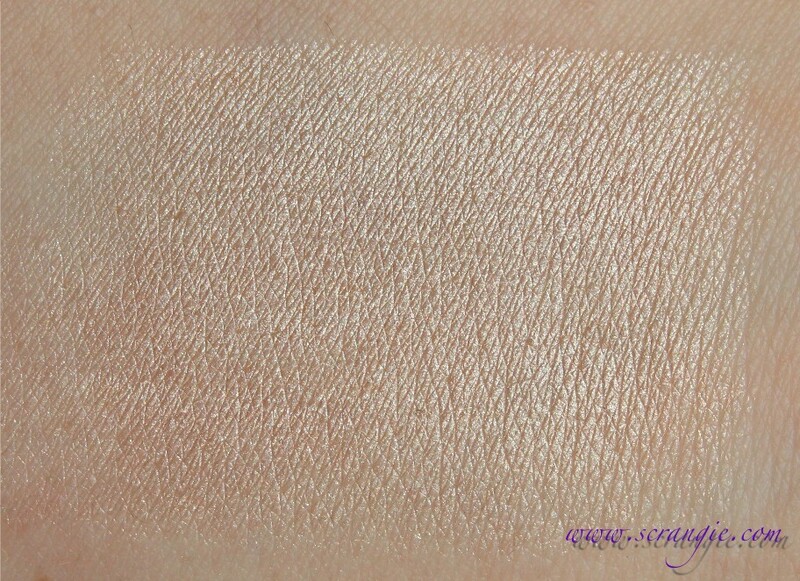 The shimmer in this is different than the usual Rescue Beauty Lounge ultrafine shimmer. It's shiny, crisp and reflective, much like glass fleck shimmer, but with a smaller particle size. 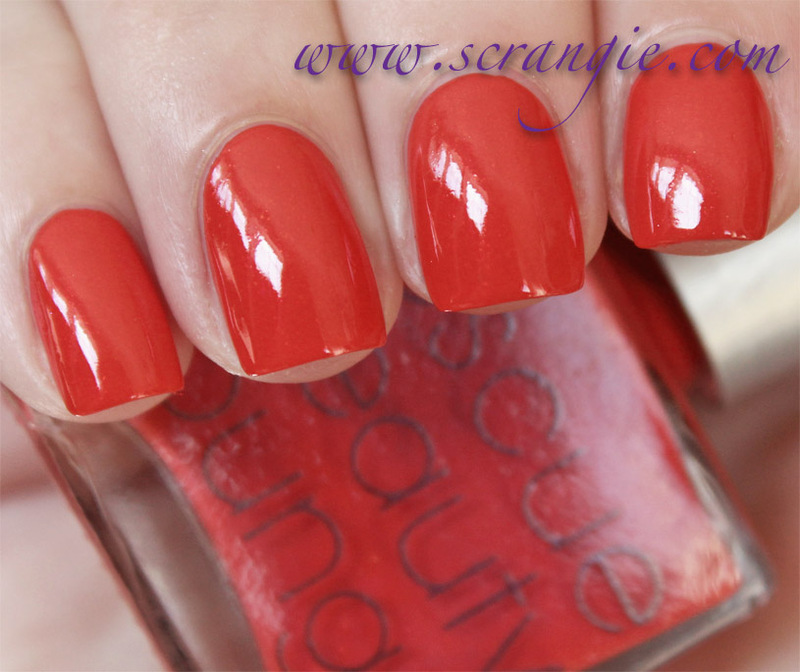 The bright red-orange base is ever so slightly sheer which, in conjunction with the lighter shimmer, gives the polish extra depth that the others don't have. The shimmer in this is very subtle, though, and only really makes itself known in bright light. Rescue Beauty Lounge Santa Fe*. Santa Fe is a light, yellow-toned orange base with subtle green-teal-gold duochrome shimmer. I have to say, this one is definitely my favorite. The combination of soft, faded orange with the glow of the green-gold color-shifting shimmer is so gorgeous. 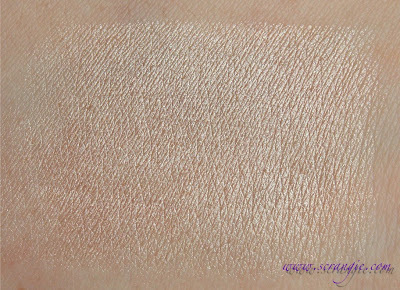 The shimmer in this is a little heavier than in the rest of the shades, so it is actually visible in any light. Bright light or sunlight only amplifies the green glow in this polish. The formula on these was varied, but generally good. Bella was the oddball since it's a jelly. It wasn't thick or gooey, but needed three coats to look even due to the sheerness and slight streaking on the first coat. Poppy and Faraway had the nicest texture, thinner and smoother flowing than all the others. The rest were a little thicker and didn't flow quite as evenly, but were still very nice to apply. All but Bella were completely opaque in two coats. Dry time is average. All are shown with a coat of Rescue Beauty Lounge topcoat. I'll admit, I'm no expert on G*, not by a longshot. I only know a little about her life and her backstory, but I have seen a lot of her work. I think this collection really captures those G* colors. What do you think? The Rescue Beauty Lounge GOMM* collection goes on sale in July and there will be a pre-order in June, but I don't know the exact dates for either. 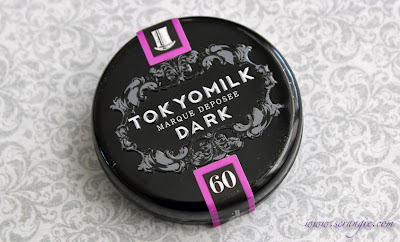 TokyoMilk Dark's Femme Fatale Collection Lip Elixirs are my new obsession. Actually, I take that back. It's TokyoMilk that's my new obsession and these perfect tins of lip balm are just part of it. 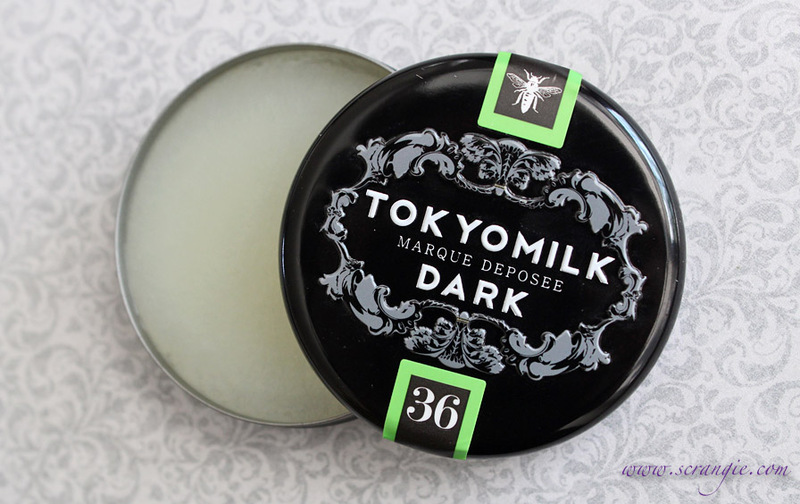 On a whim, I picked up two TokyoMilk Dark fragrances and these four Lip Elixirs and it was love at first sniff. I don't know how else to describe these but perfection. 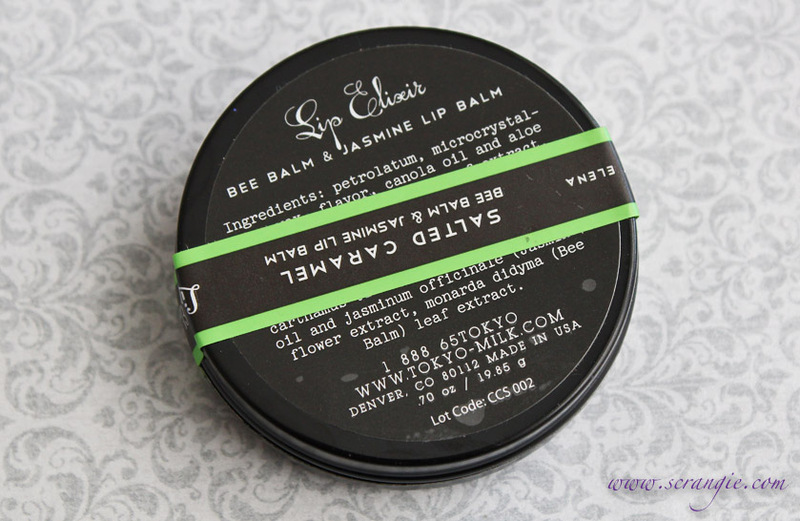 The Lip Elixirs come in a black tin sealed with a paper band. 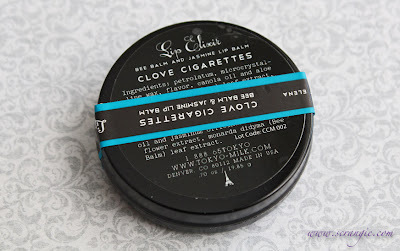 The paper band features a number and a small image on the ends, which fold over the top of the tin (Clove Cigarettes has the Eiffel Tower, Smoked Salt has a pistol, Salted Caramel has a bee and Coco Noir has a top hat.). The name of the scent is along the bottom, on the center of the band. 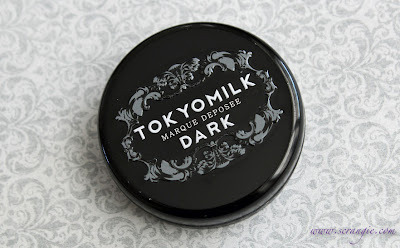 On the tin itself, the TokyoMilk Dark logo is embossed into the metal with grey and black, but the back label is a sticker. The tins themselves are surprisingly large. They're bigger than a tin of Smith's Rosebud Salve, almost identical in size to a MAC blush compact. They contain a respectable 0.7 oz (19.85 g) of product. You can remove the paper bands (they are stickers) from the tin, or you can cut the stickers along the edge of the lid and leave them on. This is how the tin looks with the band removed. I prefer the look of the tin with the band intact. 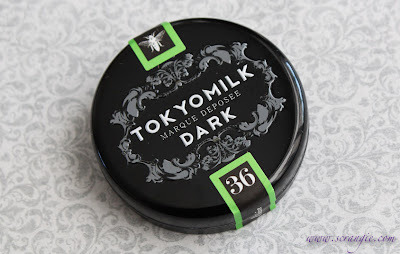 The back label has a full list of ingredients, TokyoMilk's phone number and URL, a lot code and a tiny version of the picture from the sticker. petrolatum, microcrystalline wax, flavor, canola oil and aloe barbadensis (Aloe Vera) leaf extract, tocopherol (vitamin E), tocopheryl (Vitamin E) acetate, stevia rebaudiana (Stevia) leaf extract, organic camellia sinensis (Green Tea) leaf extract, carthamus tinctorius (safflower) seed oil and jasminum officinale (Jasmine) flower extract, monarda didyma (Bee Balm) leaf extract. The strongest note in here is clove. It's spicy and fresh, not like the dusty half-bottle of stale cloves kicking around in the back of your spice cabinet. 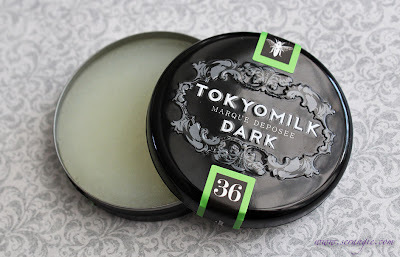 At the back of the scent is something warm and smooth, the combination of cinnamon and vanilla bean. I don't smell any lavender rose. The flavor is stevia-sweetened clove that feels slightly numbing. It tastes just like an unlit Djarum Black kretek, sweet black paper and all. This smells like a light, dry smoke in the tin. There's a bit of leather scent in with the smoke, but it's sweet and light. It actually smells just like an Irish flake tobacco, or a lighter, sweeter Latakia. There is something salty and savory about the scent, but underneath the smoke is a sweet and slightly sharp scent. I can smell molasses and burnt sugar, but only lightly. 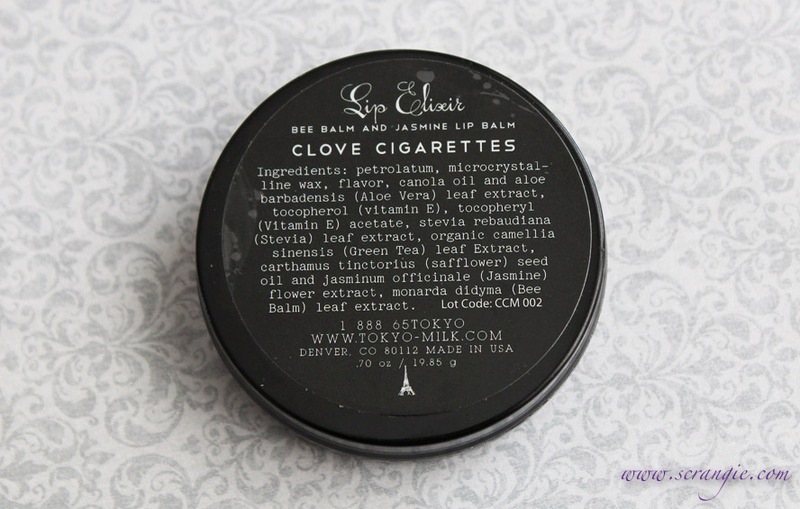 It tastes a little smoky with a strong scent of dry tobacco and leather, a little bit of a 'perfume' flavor, and it is sweet-tasting from the stevia. This one smells exactly as it should. I smell actual salted caramel, not artificial/perfumey sharp, fake caramel like most caramel-scented beauty products. It smells rich and buttery, smooth, not excessively sweet and has a little bit of a candy corn or caramel popcorn note to it. It tastes lightly of buttery caramel and is slightly sweet. This is the only one that didn't smell exactly how I expected it to. It's odd, but good. It smells very sweet and syrupy, like cherry and something else. I can't quite identify the other scent I smell with the cherry and the rum is rather faint. The next strongest note I smell is chocolate, and then something milky and a little dusty or waxy smelling. Not unpleasant, just unusual. I actually really like how it smells. The taste is sweet, mostly like perfume with a little cherry and some of that milky-dusty note. The balms themselves are colorless. The texture is firm and waxy, but not hard or dry. 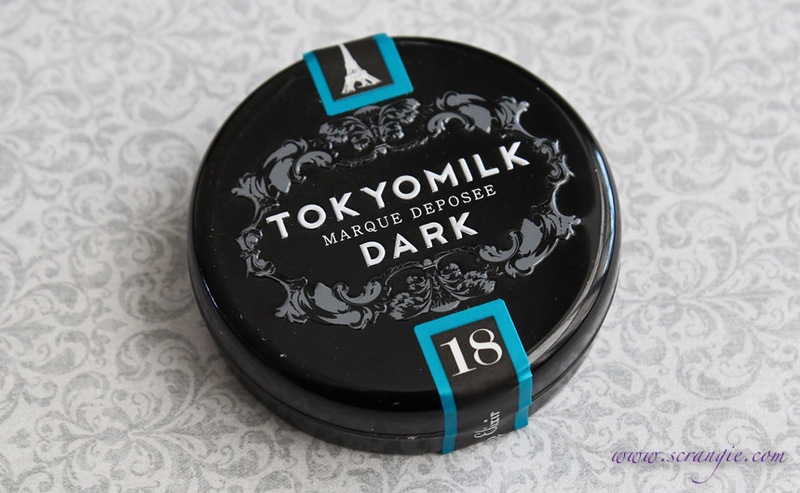 Imagine a slightly thicker, more dry Jack Black Lip Therapy. Like a cross between soft wax or hair pomade and vaseline. It's not melty or slippery and it is very thick and protective on the lips. It adds no color or shine, only a slight hint of a sheen that's barely noticeable. I adore the packaging. Everything about it is beautiful and very much my style. The scents are unconventional and awesome. It's not every day that you find a Smoked Salt flavored lip balm. Despite the unusual notes, they all smell and taste very good. The scents are strong, but not too strong. Strong enough to enjoy but not strong enough to make me sick. The balm is long-wearing and soothing, even though it feels more protective than truly moisturizing. The tin contains a lot of product. 0.7 oz. I'm sure I'll never be able to finish one of these. They're very inexpensive for how nice they are. Only $7. That's a steal. 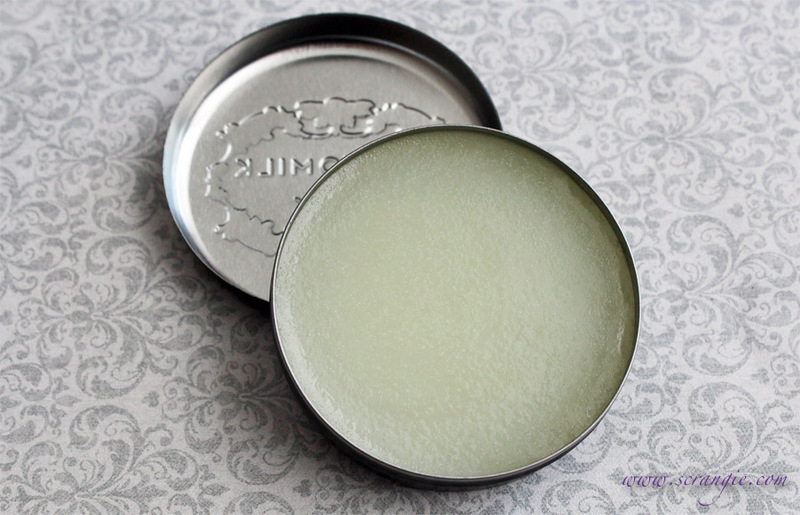 They can be used as cuticle balm or hair balm, so they're versatile. They don't seem to melt into a liquid if I leave them in the car when it's warm out. There's only enough stevia in the formula to make it taste sweet. 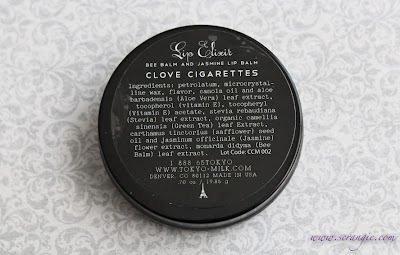 Too much stevia in lip products makes them taste bitter and I really hate the taste of stevia to begin with, so I'm glad these don't go overboard on it. I don't normally like lip balms in tins. I hate having to put my fingers in them or remember to carry a lip brush. I'll make an exception for these just because everything else about them is so great. The tins get nicked and scratched fairly easily. 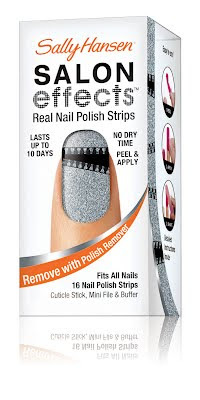 If you cut the bands instead of removing them, the ends can peel up and catch dirt and lint. 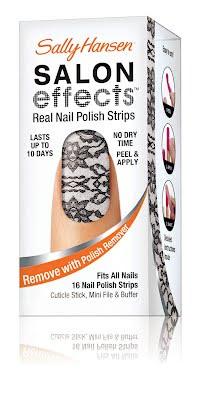 This is really a complaint about beauty.com, not about the product itself, but something important to be aware of nonetheless: If you order these from beauty.com, they put a sticker over the back that's hard to remove without damaging the label or the band. They also send glass TokyoMilk Dark eau de parfum bottles unboxed, with stickers over their labels, bouncing around in cardboard boxes without bubble wrap. The ingredients aren't so great; the first three are petrolatum (aka Vaseline), wax and canola oil. Not the most high-end formula, but at least they feel and smell nice. I love these. I already have La Vie En Rose on the way from Sephora, and I plan on picking up the rest of them at some point in the near future. 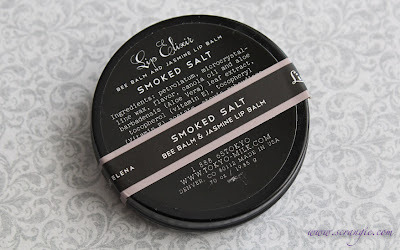 With as many lip balms as I own, it's hard to believe that I could find something unique to add to my collection, but there it is. I do wish that they weren't in tins, but then they probably wouldn't look as cool if they weren't. The tins are charming. Look at them! How could anyone resist? TokyoMilk has their own web shop, and if you sign up for the newsletter, they'll send you a code for a free gift on your first order. Sephora has also just started carrying the TokyoMilk Dark line, though the Lip Elixir selection is limited.